To say the least, the photography is superb. My admiration of those builders of "rustic furniture" has grown by leaps and bounds. By the examples shown, more art than practical usage goes into the design of these pieces. 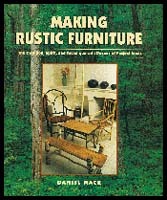 As quoted; "Rustic furniture evokes memories of the forest and the tree. ....." this is the format for the designs used to construct any of the furniture discussed and shown. The talk of inspiration, hidden meanings, nuances, texture, and symbols invoke the feelings one might get when observing a painting or sculpture. The interesting part, as I feel, is the section on tools and techniques used to construct these rustic designs. Being a practical individual, who loves working with all types of woods and designing my own projects, there are enough tips here to further ones own skills. However. I'm not so much into designing a piece just to look at as I am to make something not only beautiful but very useful also. Most of the pieces are to be used to decorate rather than actually use. I have a friend who uses the raw limb or trunk to make furniture for everyday use and his observation of the book and pieces displayed was "beautiful but then what?". Actually this is too harsh an observation but basically it describes most of the pieces. It comes down to the old adage, everyone to their own thing.